HAS-BLED score was developed for bleeding prediction in patients with atrial fibrillation (AF). Recently, it was also used in patients undergoing percutaneous coronary interventions (PCI). This study analyzes the HAS-BLED predictivity for bleedings and mortality in patients with acute coronary syndromes (ACS) without AF, and evaluates the utilization of alternative criteria for renal dysfunction. The study population was composed of 704 patients with ACS. Six-hundred and eleven patients completed the follow-up. The HAS-BLED score was calculated both using the original definition of renal dysfunction, both using three alternative eGFR thresholds (< 30, < 60 and ≤ 90 ml/min/1.73 mq). In-hospital and post-discharge bleedings and mortality were recorded, and calibration and discrimination of the various risk models were evaluated using the Hosmer–Lemeshow test and the C-statistic. In-hospital bleedings were 4.7% and mortality was 2.7%. Post-discharge bleedings were 3.1% and mortality was 4.4%. Regarding bleeding events and in-hospital mortality, the HAS-BLED original risk model demonstrated a moderate-to-good discriminative performance (C-statistics from 0.65 to 0.76). 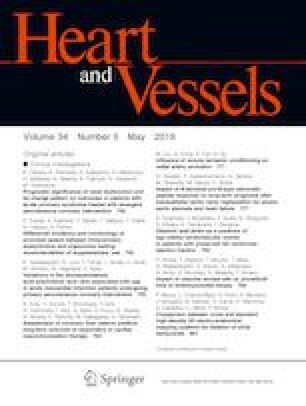 No significant differences were found in predictive accuracy when applying alternative definitions of renal dysfunction based on eGFR, with the exception of post-discharge mortality, for which HAS-BLED model assuming an eGFR value < 60 ml/min/1.73 mq showed a discriminative performance significantly higher in comparison to the other risk models (C-statistic 0.71 versus 0.64–0.66). In conclusion, in our ACS population, the HAS-BLED risk score showed a fairly good predictive accuracy regarding in-hospital and follow-up bleeding events and in-hospital mortality. The use of renal dysfunction alternative criteria based on eGFR values resulted in out-of hospital mortality predictive accuracy enhancement. The authors acknowledge the “Centro di Ricerca Aldo Ravelli” for supporting the study. We specify that they did not have any role in the design or conduct of the study, the collection, management, analysis, or interpretation of the data, the preparation of the manuscript, or the decision to publish. The authors state that they have no conflict of interest.